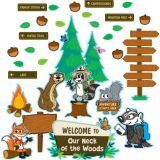 Ranger Rick and his friends are ready to welcome students and guests to your class in this charming bulletin board display. Use the blank signs as headers for centers, grouping activities, or job charts. Use the leaves and acorns to write students names or to create classroom labels. Largest tree measures 14” x 23 1/2”. Includes a teacher's guide and 71 total pieces.